There are many sophisticated devices astronomers use to rate seeing, the quality of the night sky in terms of clarity, steadiness, and darkness. They only build their observatories where the seeing is best. To have a chance at seeing the nearest galaxy, using only your eyes, you need good seeing. So first run this simple test. 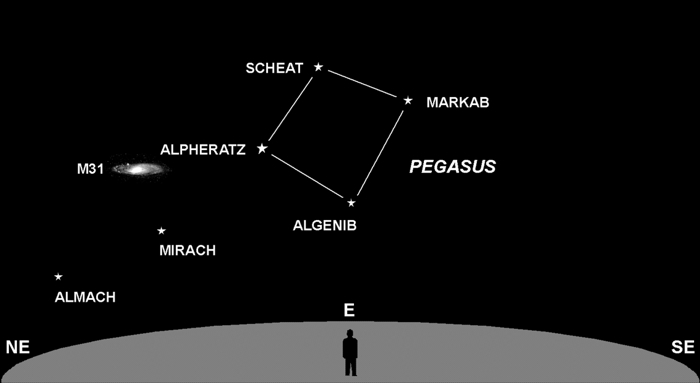 The test involves a count of the stars you can see inside the Great Square of Pegasus. The Square itself is easy to find, as it consists of the four brightest stars now rising in the east. According to the charts, there are 12-14 stars bright enough to be seen by the human eye under perfect conditions. Those stars are magnitude +6 or less. If you can see half of them, your sky is about average. If you live in the city, near bright lights, you might see none at all. If you counted at least 6 stars inside the Square, congratulations. You are now ready to try for M31, aka The Great Galaxy in Andromeda. Look straight north of Alpheratz, at a distance of one Square diagonal. You should see a faint smudge of light, about half the size of the Moon. This is M31, the Andromeda Galaxy. It’s actually larger than the Moon, but the full extent is very faint, and requires at least good binoculars to see. Through even cheap binoculars it shows as a distinct disc. The inset in the chart shows it about 5 times as large as it really (compared to the size of the Square). At a distance of 2.2 million light years, M31 holds the record as the most distant object visible to the unaided human eye.